I’ve always considered myself a Conan O’Brien fan, even though it took me a while to admit it. I mean way back when he hosted Late Night, and I found myself watching his goofy antics while I suffered from insomnia. Before that I felt tortured by my best friends whenever we had sleepovers to watch this tall, pale redhead. It was either that or Tom Green. I’ll take Conan over Green any day. Anyway, I closely followed the torch passing of The Tonight Show gig from Leno to Conan, and was well aware of the debacle and feud between Letterman and Leno when Carson retired. So I, along with millions of others, found myself on Team Coco when NBC decided to give the show back to Leno after a failed experiment and low ratings. But I’m not here to give you a history lesson, yet it kinda helps to understand what went down prior to this documentary being filmed. Even if you didn’t know (and how could you not?) Conan explains exactly how he’s feeling and why he’s doing what he’s doing. And one thing that is certainly clear: he does not stop doing what he’s doing. And what he’s doing is entertaining his fans. He says that’s all he knows how to do and what he loves to do. Oh yeah, and we see him do this on his Legally Prohibited from Being Funny on Television Tour. Part of the deal of giving up The Tonight Show was to take a huge settlement and agree not to appear on TV for a few months. So rather than be gloomy, he took his show on the road. What I admire about him is that it’s always been about his staff and his fans. He knew with him not working at all, his staff wouldn’t get paid. And these are people that had been with him since Late Night and uprooted their lives to live in LA for The Tonight Show. So he works hard for them. Again, it’s also for his fans. He’s one of those guys that would probably meet with every fan if it were humanly possible. But since he’s human, and he has people that keep him on schedule, he tried to greet as many people as he can. Love him or hate him, he’s a man of the people. And it helps that he’s hilarious. In an odd way, his sense of humor reminds me of my own. He’s just a lot better at it. Or at least his brand of it. 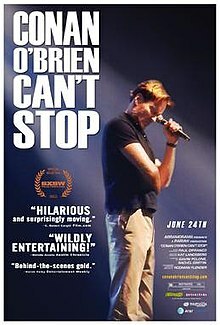 The documentary covers the whole tour, from conception to his first show of Conan. It was a very entertaining and inspiring ride. I wished I was able to attend one of his shows. I felt a lot of sympathy for him too. Not just for the loss of his show (since by this point I know he’s on TBS, plus there’s a scene in which he’s discussing it, so he knows he’ll be back on TV too), but I feel bad for how weary he can be during the tour. Even on his days off, he’s still working. He said it wasn’t the shows themselves, it’s the meet and greets and everyone wanting to talk to him. It’s bittersweet. But I see that it’s a labor of love. For his relentlessness, his commitment to entertain and his never ending work ethic, I admire him. The film is rated R for language. So if you’ve ever wanted to hear Conan drop the F-bomb, you get your wish. But it’s definitely worth checking this one out. And for your information, I had been DVRing ever episode of Conan, but I had no time to watch it and they started erasing themselves. My fandom continues and he’s one of the many celebrities I’d like to meet. I think maybe it was related to the tour, but at the same time he might not want to meet every one of his fans. Some of them are absolutely crazy. But I’m definitely chiseling in stone a second viewing with you.